Panorama is one of Philadelphia's best options for authentic Northern Italian flavors coupled with an emphasis on la famiglia. The restaurant is located within boutique Penn's View Hotel. And Panorama's proprietor, Luca Sena, is essentially everyone's favorite uncle and draws upon decades of experience as a restaurateur. 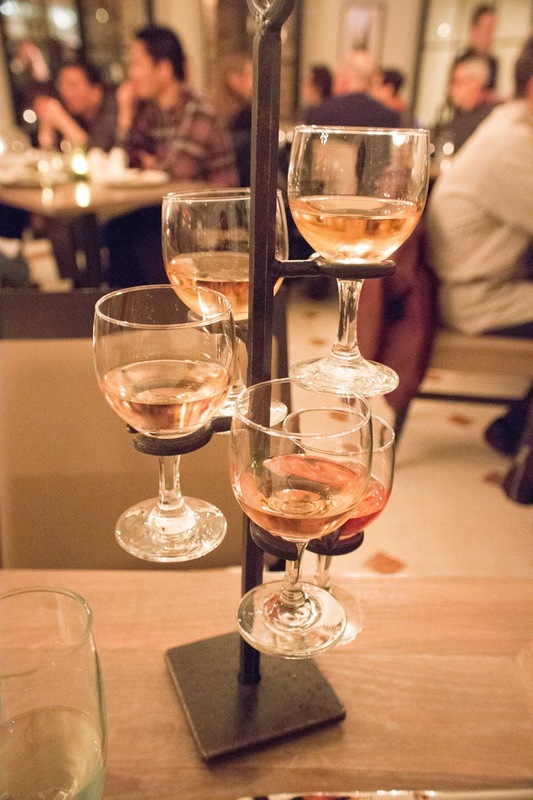 Beyond offering 120 wines by the glass via the world's largest wine cruvinet / dispensary, Sena's tapped Chef Matthew Gentile to head the kitchen. 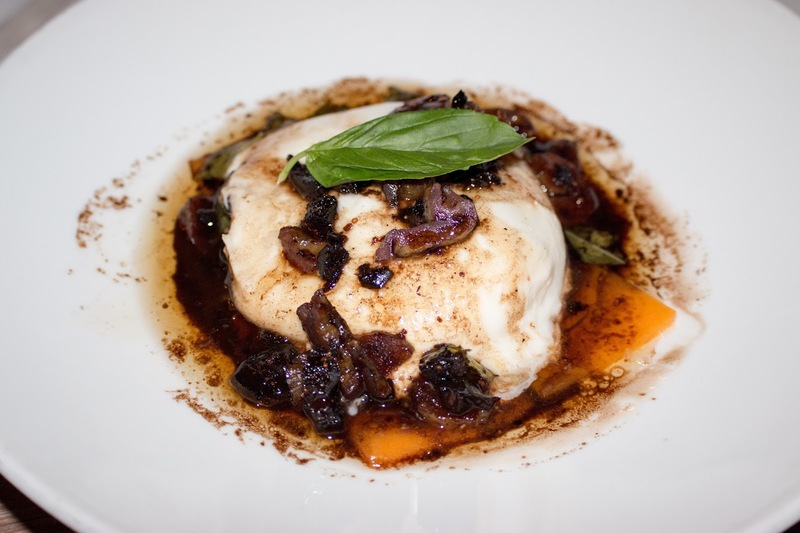 And with Gentile's background (Parc, Lacroix, and Ela), it's no surprise that an updated take on classic dishes is how the menu reads and tastes! But before we get on with the meal, let's start with the wine. Panorama does, after all, hold the Guinness Book record for World's Largest Wine Dispenser! Regardless of whether you plan to dine or simply imbibe, it's the perfect spot for a date night or girl's night out to indulge with a flight of wines. 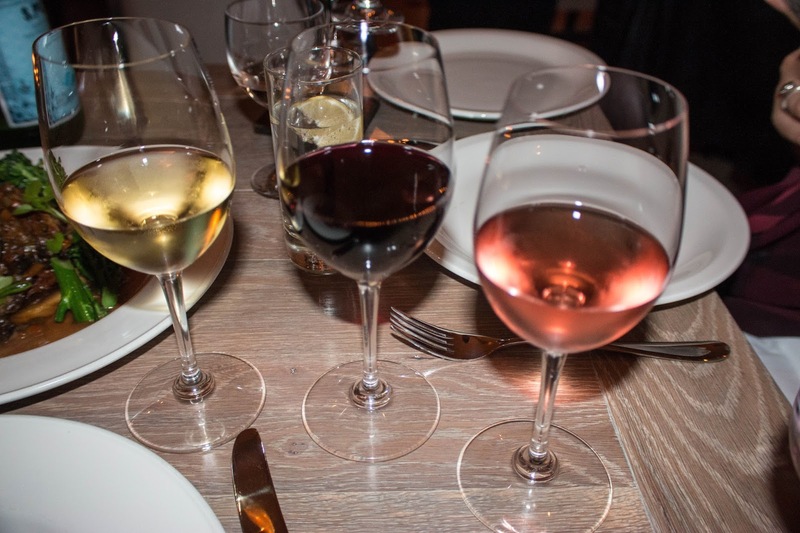 Several certified sommeliers are in house and have curated a wonderfully witty vino menu, ranging from "Blanc Expressions" to "Cab Fare." 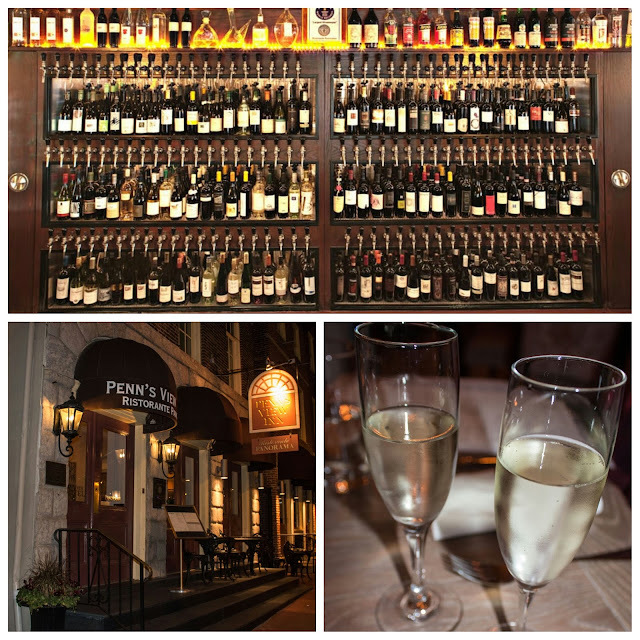 And the generous pours and price points suit all budgets and tastes. The GF enjoyed the light and subtly sweeter tastes of rosé. It's nice to see how the wines progress with the meal and clearly, that's the intent. The Scarbolo '13 was particularly enjoyable with an intense fruitiness that's emblematic of rosés. When ordering wine with dinner, I typically lean towards Cabs and Syrahs so was intrigued by the Future Cult Classics. The biodynamic Breton was particularly forward with dark berry and the Wind Gap was one of my favorites - medium-bodied and savory. 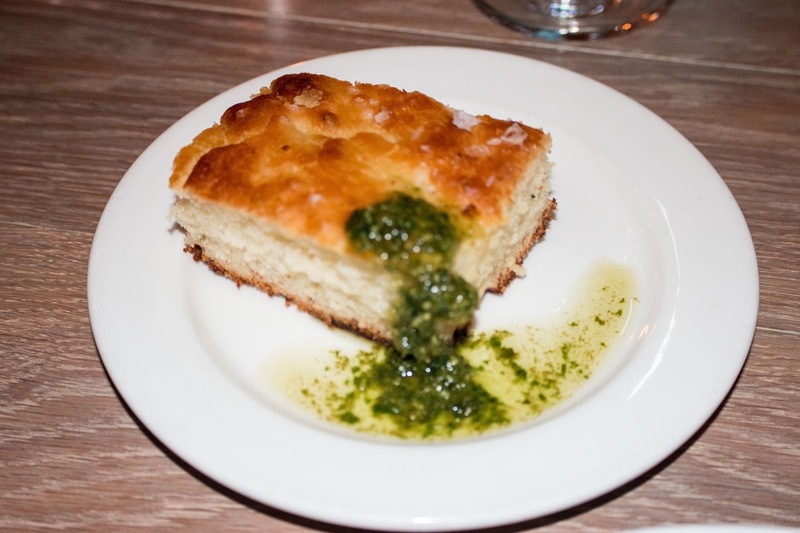 If you decide to dine as well, meals will start off with housemade foccacia. Light and airy within, with a great crust speckled with sea salt on the exterior. The garlic pesto was spot on as well. The burrata was creamy, sweet, and light, but held up to the vibrant acidity of the balsamic and the heft of the butternut squash. Chestnuts added a textural note to each bite, with an enjoyable richness in its own right. 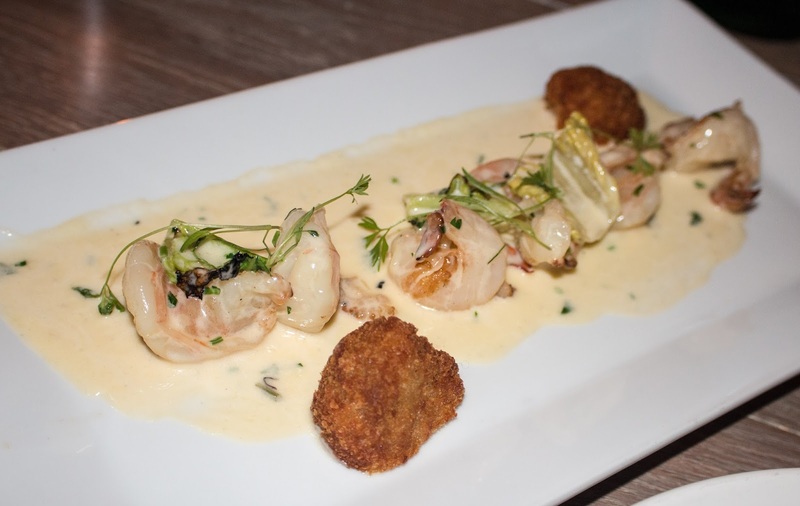 The shrimp were snappy, lightly seasoned, and dressed with a beautiful buerre blanc, adorned with bits of grilled romaine. Wonderfully crisped white bean croquettes added a substantive component to the dish and were enjoyably hearty. Perfect to sop off some more of that sauce. The airy, yet crisp crepe held plenty of fresh crab and lobster meat to create a light bite before we enjoyed our mains. 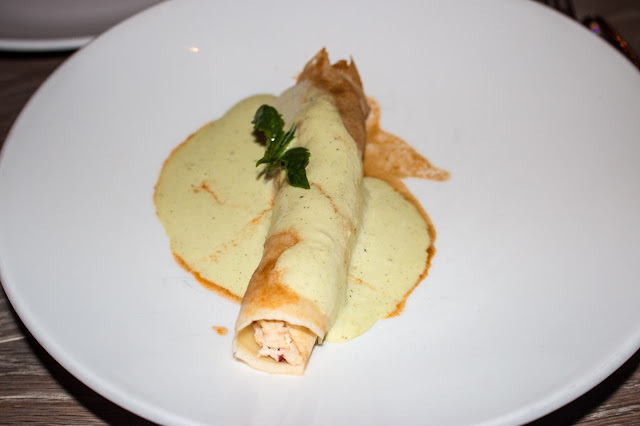 I appreciated that there was just enough of the lobster sugo providing a countervailing acidity and savory depth, in contrast with the herbaceous hollandaise. 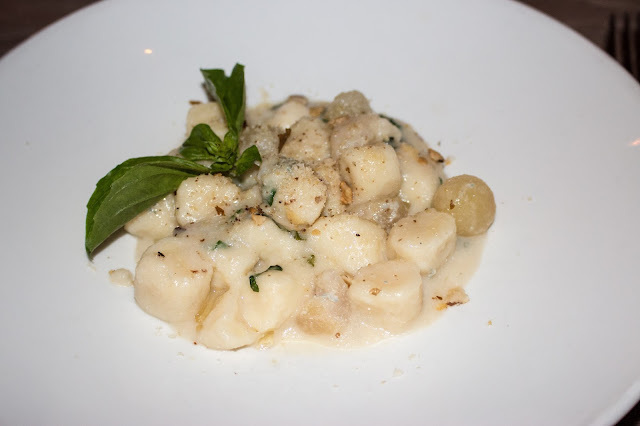 Pastas are made in-house and based on Panorama's gnocchi, I'd highly recommend at least one with your meal. The gnocchi were pillowy clouds of gorgonzola goodness. If you think blue cheese and pasta don't mix, you'd be wrong. Gorgonzola dolce is one of our favorite cheeses, with its sweet and subtly mild funk. Just enough of the gorgonzola sauce coated the gnocchi to create a savory, salty bite. This was balanced by sweet Anjou pears that were cut to the size of the gnocchi, with bits of black walnut offering up some textural contrast. Rich, to be sure, and definitely one of our favorites! Another standout from the night was the scallop dish. You can always count on the GF to order it if it's on the menu and I'm so glad she did. 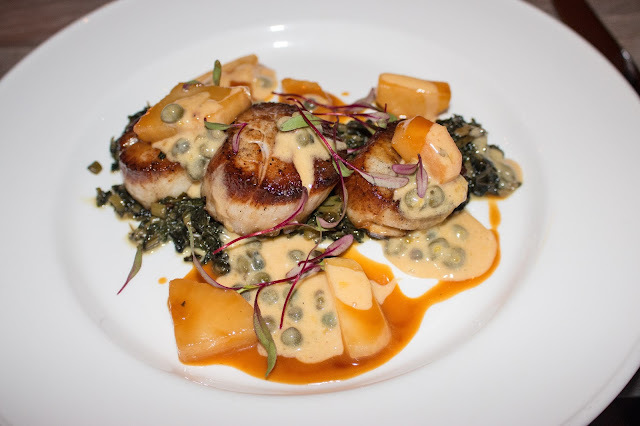 These bivalves were expertly cooked, with a salty sear that contrasted nicely with the innate sweetness of the scallops. The slightly bitter turnips were tempered by a braise with orange juice and offered up some complexity to each bite. But the true star of the dish? The interplay between the wonderfully braised swiss chard and that stellar caper zabaglione. It offered up a sweet richness that helped to support the scallops. Get this dish! 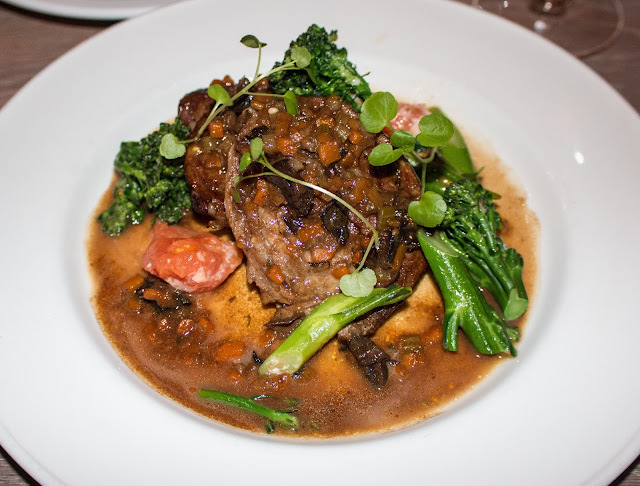 Not to be outdone, the braciola here is incredibly tender and savory. The garlic is slow roasted and complements the earthy porcini sauce well, with the broccolini providing some levity to each bite and the roasted tomatoes offering up some acid. The meat lover in you will be satiated! 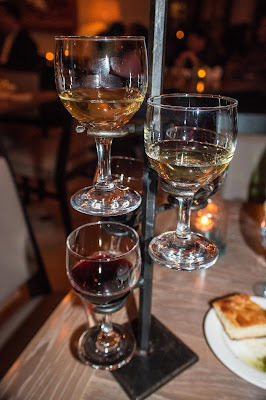 And with our mains just served and our wine flights not entirely drained, Wine Director Bill Eccleston sent out three additional glasses to enjoy. There's that famiglia sense of hospitality! The GF had her eye on the pizelle sandwich and her sweet tooth could not be denied. 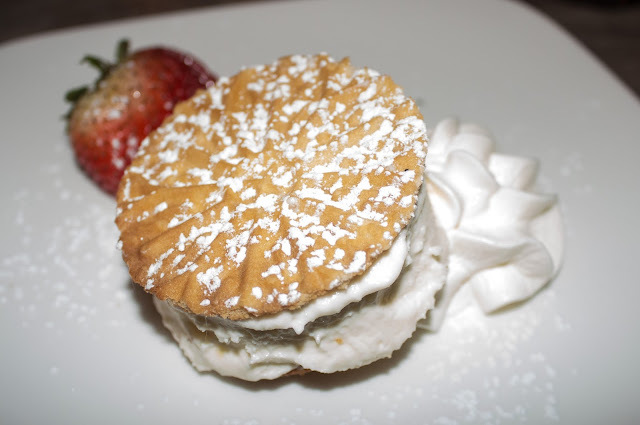 The light semifreddo had the tart essence of limoncello, sandwiched between two crisp pizelle cookies. The perfect palate cleanser to close out the meal. 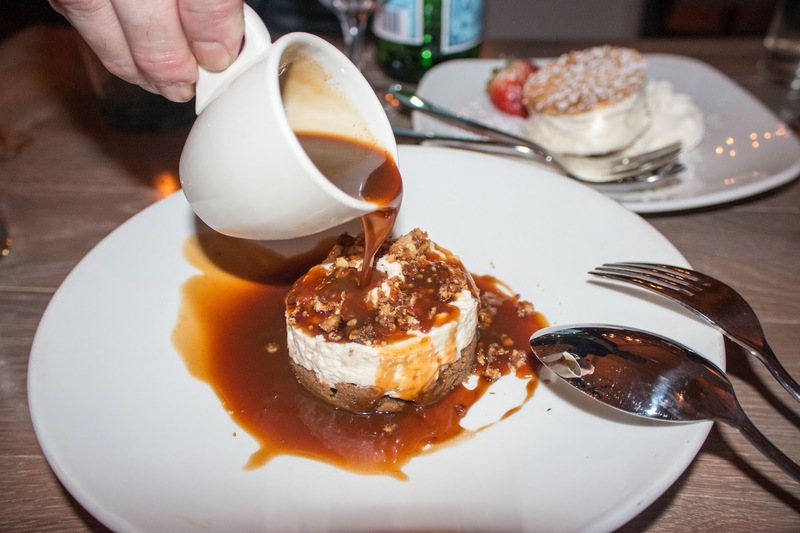 But of course, the kitchen sent out their budino, which was clearly special. Drowned in an espresso caramel, the banana mascarpone was subtly sweet and creamy, sitting atop a pat of crisped, buttered lady fingers, with bits of walnut offering texture throughout. Rich, decadent, and a showstopper. To truly end our night, Bill brought out some digestifs to round out the meal. 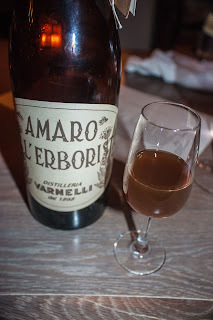 I enjoy a more bitter route and he selected the perfect one for me - Amaro Dell'Erborista. The floral nose belies a bright, bitter, and herbal finish. 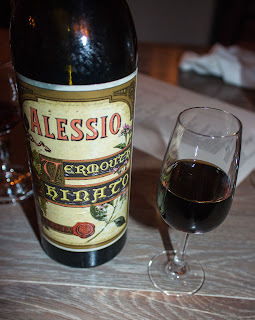 I might need to pick up a bottle beyond just my usual fernet branca! A softer route for the GF came in the form of vermouth. Alessio Chinato had a nice interplay between sweet and bitter, with a finish that was lengthy and enjoyable. I have to say that service was beyond reproach - I mean it seems like such a simple thing, but how often are your desserts served on a cold plate? Should be standard, but few and far between. So if you're looking to enjoy Italian beyond just the typical Southern style marinaras, Panorama has got you covered, and then some. If you're looking for a date night to venture into or expand your knowledge of wine, Panorama can clearly take you on a flight (pun intended!). Highly recommend stopping by - I know I'll be back! FTC Disclaimer: This meal was organized by Gloss PR to highlight Panorama's updated menu. Regradless, my opinions are mine alone and, therefore, unbiased.